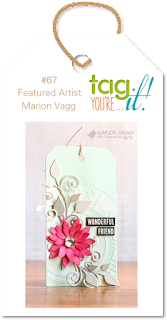 When I saw Marion Vagg's gorgeous tag that is the inspiration for the Tag You're It Challenge #67, I reached for my snippet box and found some things that would work beautifully for the challenge. All of the elements in my tag, except for the ribbon, are from that box of little treasures. I love making things from it's contents! 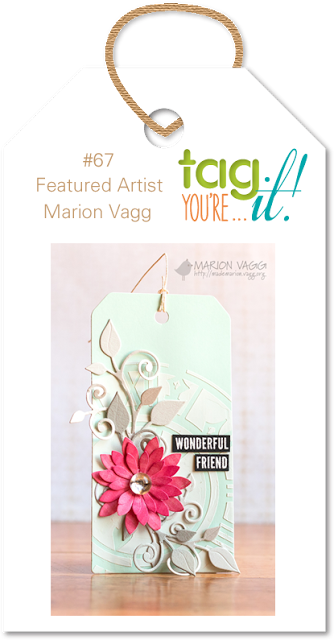 Beautiful, love your blooms, many thanks for joining us at Tag You're It Challenge. Wonderful tag, Stephanie! Those are some beautiful rolled roses! I love using snippets out of my box! It's getting rather full these days. Beautiful ribbon detail too! Thanks for joining in on the fun over at Tag, You're It! Be still my beating heart! A tag made from snippets left over from other projects makes me very happy, too! Happy 3rd Birthday To Time Out!! !